Huge Book Sale for Blog Readers Only! I have been an ABE bookseller for a long while, and my sales there have been consistently good but a mite slow for my pecuniary needs these days; those hospital bills are monsters! So, in my first round of trying to raise cash I'm making a special offer to you blog readers. My ABE prices are already quite low, but I've taken all my inventory off there and I'm offering everything to you at 50% off my ABE prices (in many cases, less than I paid). To see the list of over 1000 titles follow this link. My specialties on ABE are newspaper bound volumes, sci-fi pulps, vintage fiction and lots of miscellaneous good non-fiction. You'll find some books related to cartooning as well, but they were never my focus on ABE. The list, I'm sorry to say, is unsorted (well, it's sorted by title) but hopefully that will make the hunt that much more fun. Note that the prices you'll see on the books are the ABE prices. When you order everything will be 50% off. My shipping rates and payment options are listed at the top of the sales list. If you have any questions or want to place an order you'll find all my contact information there. Happy hunting! Once again, click on this link! 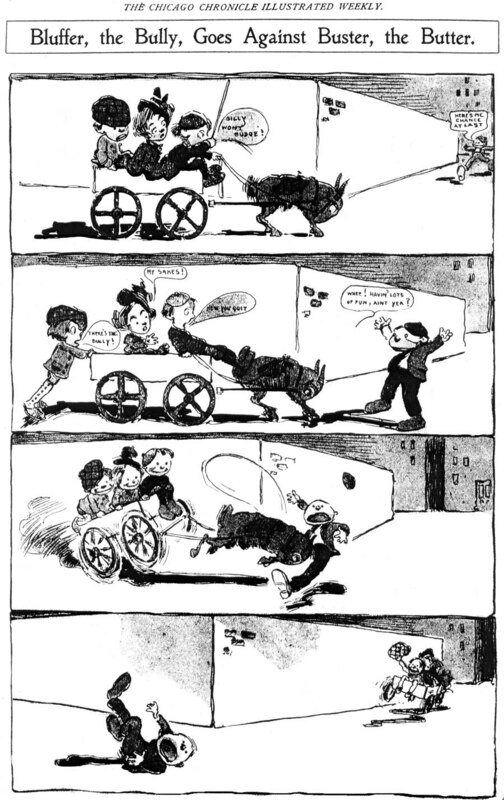 Here's the last of the Chronicle comics (at least until I see more microfilm). We have another Lederer offering, titled Maudie's Beau (the careless typesetter notwithstanding), plus an episode of The Tweedledum Triplets by none other than William F. Marriner. The appearance of Marriner was the big surprise for me since I've not seen any of his work running in Chicago before. Looking over his other credits, though, it does seem possible that he left the New York Hearst camp for awhile in 1903 (this is where he worked before and after this tangent in 1903). How he ended up in Chicago working for the Chronicle is anyone's guess. I forgot to mention yesterday that those two strips ran in all three dates I've been able to see (2/1, 3/15, 3/22) as did the two for today. 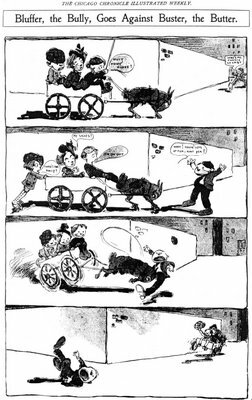 Here are two more of the comic strip series from the Chronicle, Musical Maurice by Fred Lewis and Red Squab by Charles Lederer. Lederer kicked around in Chicago newspaper circles for many years and was also a long-time seller of 'how to draw' books. 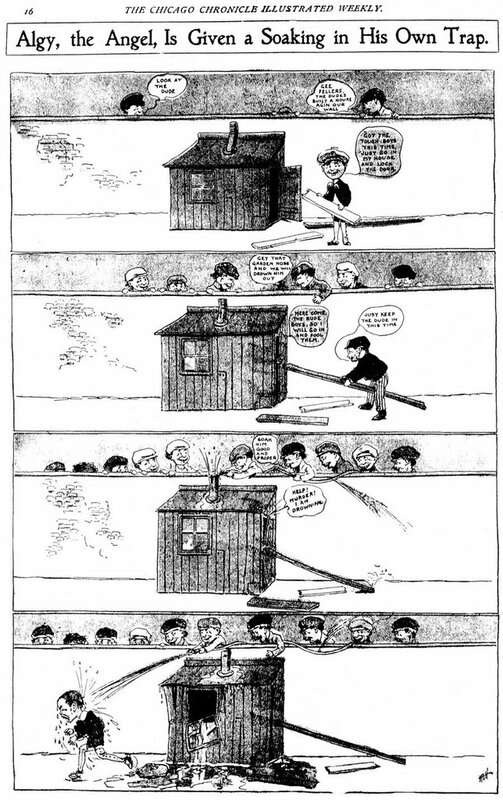 Lederer contributed more material to the Chronicle section than the others on staff, and usually did the cover drawing for the magazine. Notice that the Red Squab story is to be continued next Sunday - that's a real rarity in such an early comic strip. Any relation to Charles Lederer the theatre and movie writer? According to imdb, that Lederer was born in 1906, so it couldn't be the same guy. 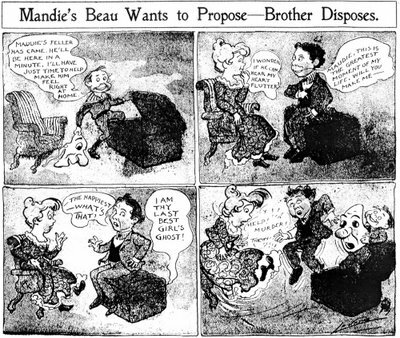 Here's another pair of the Chronicle's Sunday comics. Silas Shrewd was by C.E. Ashbrook and Bluffer The Bully was by Fred Lewis. The Bluffer gag is micron thin, but what a wonderful art style! 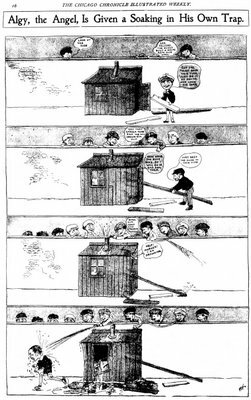 Too bad this Lewis fellow apparently didn't continue his cartooning career (leastways I've never heard of him). From my thin sampling of sections, both Silas Shrewd and Bluffer The Bully ran on 3/15 and 3/22. Not my aera of expertise, but I am glad to have you back. Awhile back Alfredo Castelli alerted me that he had discovered a comic section, dated 1903, from the Chicago Chronicle. 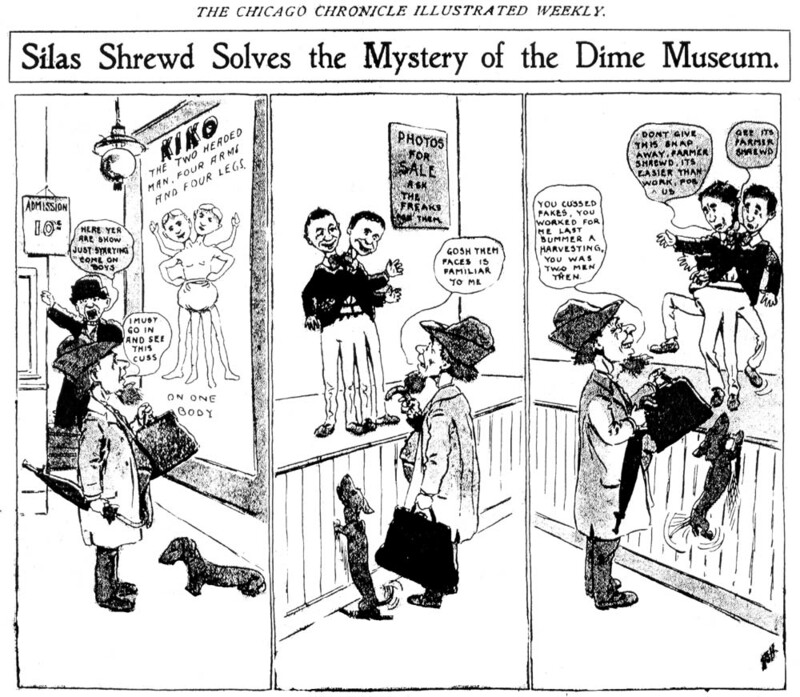 The Chronicle was a very minor Chicago paper; it existed only 1895-1907. The banker who started it had to shut it down when his bank went belly-up. It was definitely not the sort of paper in which I would have expected to find anything interesting. At best it was the sort of paper that would, if it had color comics at all, run the preprint section from World Color Printing. But that's not the case. 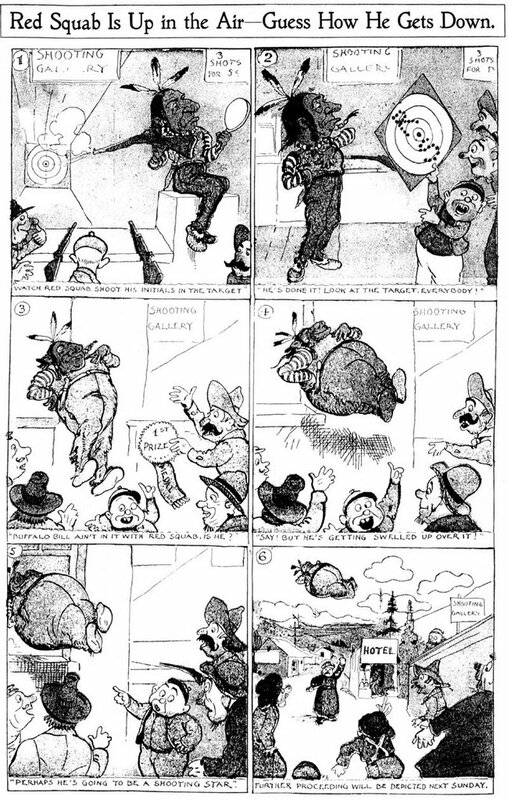 Amazingly enough, in 1903 the Chronicle was running a 16-page color "Illustrated Weekly", a section of comics, humor, and stories. Better yet, all the material, as they proudly proclaimed, was created "by Chicagoans for Chicagoans" - all locally produced material, no syndicate stuff! Naturally I wanted to know more, so I ordered up the microfilm which just came in recently. 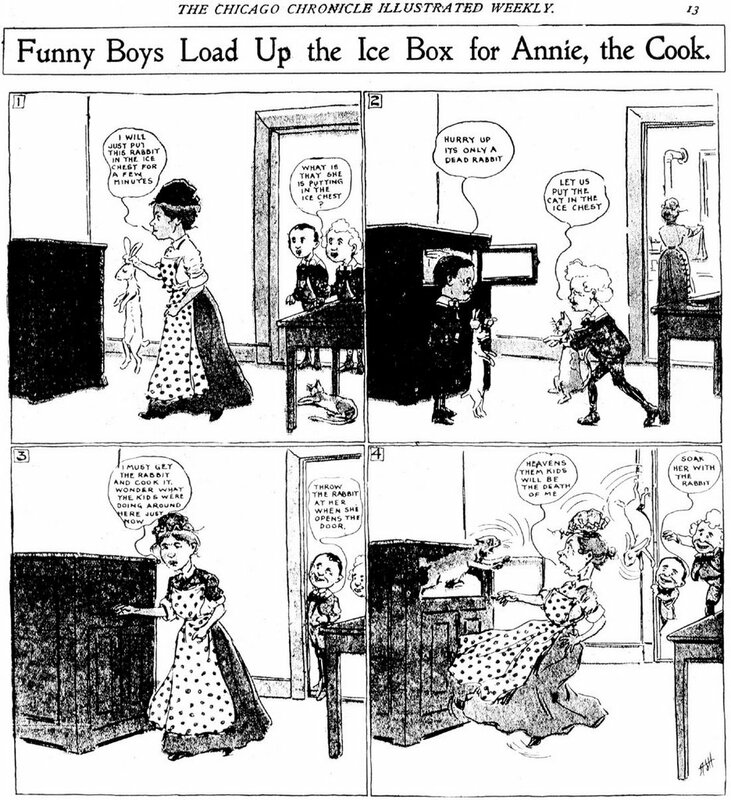 Unfortunately the microfilm I received, which covered January 1 - May 16 1903, only included three of the illustrated weekly sections. The section definitely ran every week, though, as it was advertised on the front page of the Sunday issues. The rest just weren't microfilmed. So what I can tell you of the Chronicle in early 1902 is severely limited, but even with just those three sections (dated 2/1, 3/15 and 3/22) I found eight different continuing series! I'll show samples of each here, two per day. Keep in mind when looking at these that they came from microfilm, which is unkind to color material even in the best circumstances, and this film was pretty old and battered. I cleaned up the images about as much as was practical. Today we'll start off with Algy The Angel and Annie The Cook And The Funny Boys, both by C.E. Ashbrook, who signed himself 'Ash'. 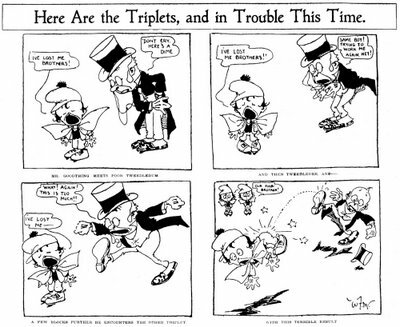 Ashbrook's only other known work is for the Chicago Daily News, where he contributed to their daily comics page from 1906-1909. 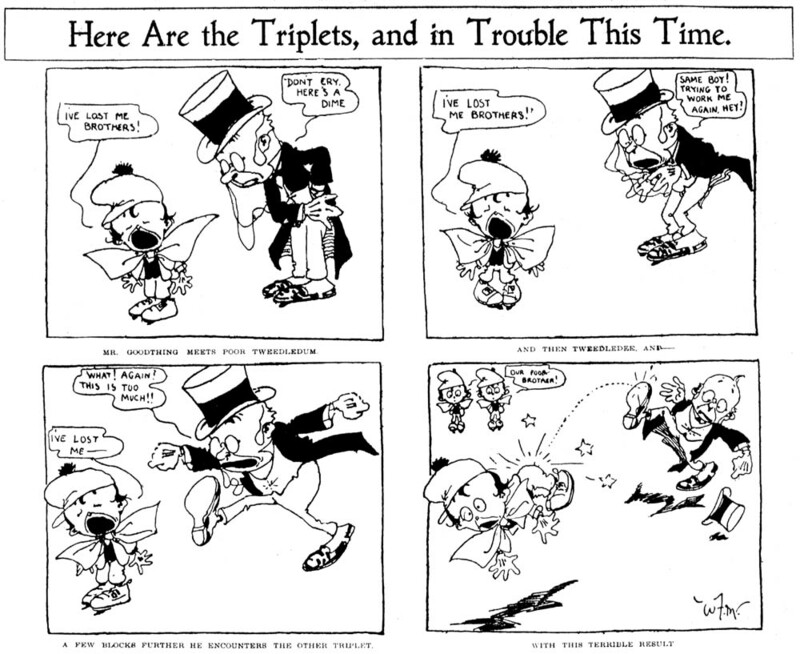 Both of these strips ran in the 3/15 and 3/22 sections. Does anyone out there have any Chicago Chronicle Sunday sections? If you do, please share a list of the contents with me! Hi Folks; I'm back (sorta). Thanks very much to those of you who sent replies and emails of encouragement. It meant a lot to me that you took a few moments to write words of encouragement to a person many of you know only through a blog. To bring you up to date, Judy's operation was a success and she is recuperating quickly, up and about and in great spirits. However, she is also going to need months of follow-up treatment. I apologize for being obscure about her situation. This is necessary because Judy and I are self-employed in a business in which our customers depend on our being available to help them. If they get the idea that Judy's health issues might cause us to close or curtail our business (which is NOT the case), some of them may well decide to get proactive and jump ship. That we definitely can't afford, especially considering the humongous medical bills that we now have to pay. Of course I don't tell our customers about my blog, which has no relation to our business, but I suspect that some of them might chance upon it by Googling my name. I have, in fact, received a few phone calls from customers who acted a bit odd, as if they were aware that something was up. Maybe I'm just being paranoid, but better safe than sorry. If any of you want specific information, feel free to email me. Great news about Mrs. Strippersguide! know where your priorities should be.